Mr. Andreas Chrysostomou graduated from the University of Newcastle upon Tyne in UK with a Bachelor of Engineering with Honours, in Naval Architecture and Shipbuilding and holds a Masters in Business Administration (MBA). 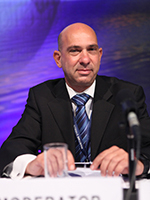 In 1993 Mr. Chrysostomou joined the Department of Merchant Shipping, the Competent Authority for Maritime Affairs of the Government of the Republic Cyprus, as a Marine Surveyor where 2014 he first became the Acting Director and then the Director. In April 2016 Mr. Chrysostomou Joined the Private Sector as CEO of Transmed Shipping Co. Ltd. In 1999 he was elected as Chairman of the IMO Design and Equipment Subcommittee and in 2003 as Chairman of the IMO Marine Environment Protection Committee (MEPC) a position he hold till 2013. He has also worked with other UN agencies and served as member of the Board of Governors of the World Maritime University. Mr. Chrysosotmou's work includes papers presented in Conferences and Seminars around the globe. In 2011 he was presented the Distinguished Public Service Award by the United States Department of Homeland Security, United States Coast Guard, for his invaluable service to International Shipping. The same year he was presented the Award for Outstanding Contribution to Sustainable Shipping, and in 2013 the GST Award Leading Shipping Personality of the Decade 2003 - 2013. In 2015 he was also awarded the Lloyd's List Greek Shipping Award of the International Personality of 2015. He also served as President of the Institute of Marine Engineering, Science & Technology (IMAREST) in 2013.